Get your treatment now and Pay Later find out how? Welcome to Smudgeproof Inc. Permanent Makeup Studio offering customised, professional results in this transformational 'in-demand' art form. We bring extensive industry experience combined with a passionate focus on enhancing individual facial features to maximise the unique beauty potential of every client. Amazing enhancements are possible with the correction of badly shaped eyebrows which instantly creates a dramatic difference to your overall facial expression. Lips that have lost definition and shape can be coloured and contoured for a more youthful appearance. Eyeliner tattooing whether subtle or bold will define your eyes and ensure perfect lines that won't smudge. Time consuming makeup routines can be eliminated with these innovative cosmetic tattoo techniques. 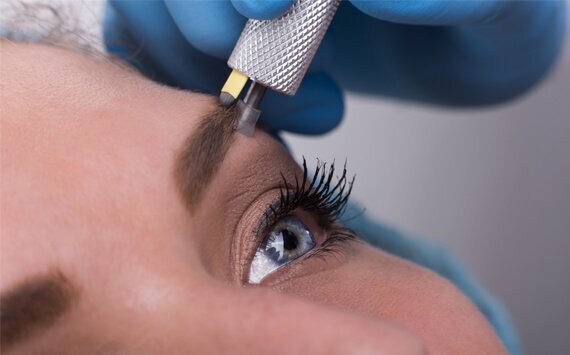 German engineered advanced 'digital' technology' delivering precise, uniform colour implantation with minimal pain and skin trauma for faster healing following permanent makeup procedures. Sterile, single-use hygienically sealed needle cartridge system provides the ultimate protection in Health & Safety Standards. We use the highest quality, hypoallergenic US and German permanent makeup pigments. Prescription grade topical anesthetics for effective pain management. Single-use sterile procedural items. Eliminate lengthy beauty routines with professionally applied long lasting semi permanent makeup that won't wash off. Great solution for women with busy lifestyles or vision and dexterity issues. I am delighted with my new eyebrows. Also my eyeliner and lip tattoos are absolute perfection! Loving my new Eyeliner. Should have had this done years ago. I get my eyebrows, eyeliner and lip line done, fabulous job at really reasonable prices. Beautiful work. Very pleased with my natural looking Eyebrows. Perfectly shaped brows after correction work at Smudgeproof Inc. Great job. Absolutely thrilled with my new Eyebrows. Highly experienced technician who takes the time to do perfect work. Recently had my eyebrows done and I couldn't be happier!. I can't say thank you enough for making such a beautiful difference to my appearance and self-esteem. Barbara is an expert in her field. I love my new Lip line and Eyeliner. Confidently recommended. Professional work at affordable prices. Highly recommended. Great advice and exceptional attention to detail. My expectations were both met and exceeded!.